不可算名詞 [状態または期間を表わす時には 可算名詞] (濃い)霧，濃霧 《★【比較】 かすみ (mist) より濃い，mist より薄いものは haze (薄霧)》. A dense fog rolled over the city. 濃霧が町をおおい込んだ. We had bad fogs this winter. 今年の冬は霧がひどかった. The fog cleared [lifted]. 霧が晴れた. 不可算名詞 [具体的には 可算名詞] 【写真】 (ネガ・印画の)くもり，かぶり. They used dry ice to fog the stage. 彼らは舞台を霧でおおうためにドライアイスを使った. The steam fogged my glasses. 湯気で眼鏡が曇った. I was fogged by his question. 彼の質問に当惑した. The windshield has fogged up. フロントガラスが曇った. The fog was so thick that I had to drive very slowly. Next morning the fog cleared up. I am in a fog about which career to choose. 霧; 《写真の》 曇り, かぶり; フォグ《CG で, 奥行きなどによって画像をかすませる効果》. Origin uncertain; but probably of North Germanic origin, from Danish fog (“spray, shower, drift, storm”), related to Icelandic fok (“spray, any light thing tossed by the wind, snowdrift”), Icelandic fjúka (“to blow, drive”), from Proto-Germanic *feukaną (“to whisk, blow”), from Proto-Indo-European *pug- (“billow, bulge, drift”), from *pew-, *pow- (“to blow, drift, billow”). Related to German fauchen (“to hiss”). (uncountable) A thick cloud that forms near the ground; the obscurity of such a cloud. (uncountable) A mist or film clouding a surface. A state of mind characterized by lethargy and confusion. I was on my way to the door, but all at once, through the fog in my head, I began to sight one reef that I hadn't paid any attention to afore. (photography) A silver deposit or other blur on a negative or developed photographic image. To count sense thick cloud, bank of fog is usually used. To count sense clouding a surface, foggy patch is usually used. (intransitive) To become covered with or as if with fog. (intransitive) To become obscured in condensation or water. The mirror fogged every time he showered. (intransitive, photography) To become dim or obscure. (transitive) To cover with or as if with fog. Fogging for adult mosquito control began on June 4th in residential areas. Until September 25th, the Metro area was fogged eleven times, using nine truck-mounted foggers, eight hand swing foggers, and two boats. (transitive) To disperse insecticide into (a forest canopy) so as to collect organisms. (transitive) To obscure in condensation or water. Unfortunately, the pendulum has swung way too far to the other end where the saying in the industry is is that if you could fog a mirror, you could get a loan. (transitive) To make confusing or obscure. (transitive, photography) To make dim or obscure. Origin uncertain. Compare Scots fog (“moss; lichen”), Norwegian fogg. A new growth of grass appearing on a field that has been mowed or grazed. (Britain, dialectal) Tall and decaying grass left standing after the cutting or grazing season; foggage. (transitive) To pasture cattle on the fog, or aftergrass, of; to eat off the fog from. (intransitive) To become covered with the kind of grass called fog. fog in The Century Dictionary, New York, N.Y.: The Century Co., 1911.
fog in Webster’s Revised Unabridged Dictionary, G. & C. Merriam, 1913. Fog is a collection of water droplets or ice crystals suspended in the air at or near the Earth's surface. 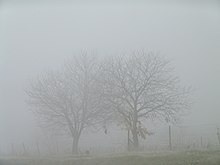 While fog is a type of a cloud, the term "fog" is typically distinguished from the more generic term "cloud" in that fog is low-lying, and the moisture in the fog is often generated locally (such as from a nearby body of water, like a lake or the ocean, or from nearby moist ground or marshes).